Two movements from Boismortier's Sonata Op.7 No.1, arranged for three violins and playable in the first position throughout. 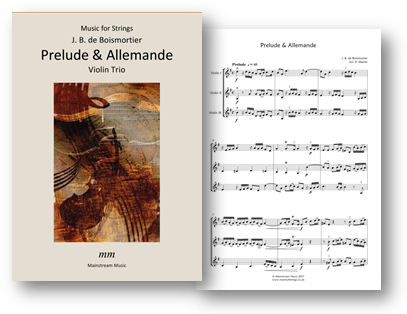 The PDF contains a part for the viola in lieu of the third violin. Also available for two violas. Click here to listen to a recording of the piece. The fourth sonata from Boismortier's Op.2, adapted and arranged for two violins. 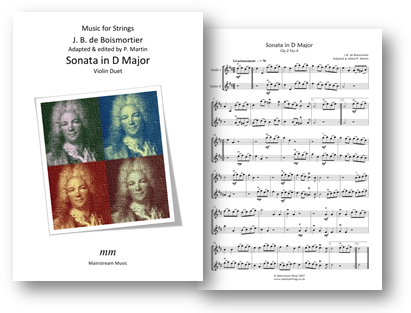 The PDF contains the score and individual parts. Also available for two violas. Click here to listen to a recording of the piece.